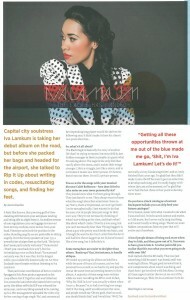 Capital city soulstress Iva Lamkum is taking her debut album on the road, but before she packed her bags and headed for the airport, she talked to Rip It Up about writing in codes, resuscitating songs, and finding her feet. It feels like forever, that yawning gulf of time standing still between your aeroplane landing and being able to alight from it. An endless stream of non-regulation carry-on luggage is removed from its tiny confines, mere inches from your head. Pinstripe stilts jostle for position in the aisles. Standing angrily seems preferable to sitting angrily. Over the tinny speakers of your 737, a powerful set of pipes fires up the funk. The lyrics don’t seem particularly welcome (“Turnaround / Don’t you come back this way”), but the intimidating voice on Sola Rosa’s ‘Turnaround’ certainly was. So it was that, for the longest while, you couldn’t fly domestically on Air New Zealand’s travel routes without listening to lva Lamkum. The Black Eagle is basically the story of another life that I’m trying to expose, but not publicly, just hidden messages in there so people can guess what I’m talking about. The eagle is the only bird that can fly above the storm, and it makes their wings stronger. Life is a struggle, just like a storm, and to overcome it makes us a better person. lt’s honest, but it’s not out there. I‘m still a private person. You co-write the songs with your musical director Caleb Robinson — how does it feel to take notes on your more personal lyrics? They kinda know what I’ve been going through. They just leave it to me. They always want to know what the song’s about but sometimes I have to say ‘Sorry, that’s a bit personal, we won’t go there’. I write metaphorically. I just wanted to do that because a lot of people interpret songs in their own way. They’re not necessarily thinking of what I was writing at the time, and that’s what l like about what l create. 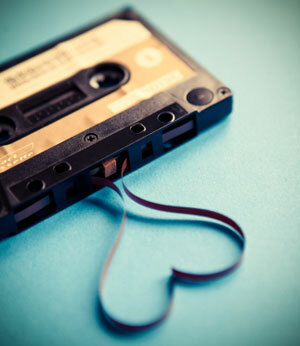 I’ll write a love song, but you can’t necessarily hear that. ‘Flying Daggers’ is about a guy who pretty much broke my heart, and I thought he was the devil so I called him the devil and had him throw daggers at me. it doesn’t sound like a love song, but it definitely is. Some metaphors are easier to decipher than others. ‘Bankrupt Visa’. for instance, is hardly oblique. We ended up putting the album on hold for a while because of financial reasons, and we had personal lives as well, so we had to try and pay the rent at the same time as investing money in this album. A majority of these songs were written while we were recording the EP in 2008. In fact, ‘Why Do I Fall in Love’ was actually written when l was 17. Because I’m so bad at writing love songs, I left it that long, and I would just jam the verse, and people would say ‘Oh my gosh, that’s so cool, you should finish that!’ and I would say ‘Well. I’m not really a lovey kinda songwriter‘, and so I only finished that a year ago. 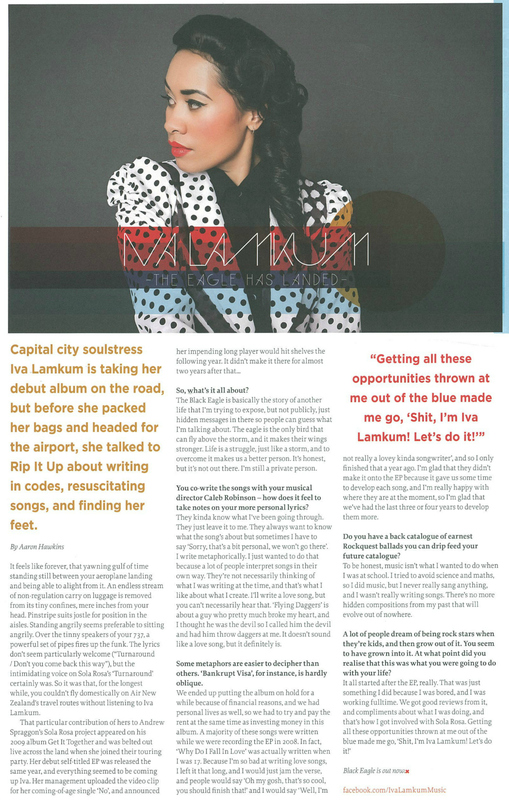 l’m glad that they didn’t make it onto the EP because it gave us some time to develop each song, and I’m really happy with where they are at the moment, so I’m glad that we’ve had the last three or four years to develop them more. Do you have a back catalogue of earnest rockquest ballads you can drip feed your future catalogue? To be honest, music isn’t what I wanted to do when l was at school. I tried to avoid science and maths, so I did music, but I never really sang anything, and I wasn’t really writing songs. There’s no more hidden compositions from my past that will evolve out of nowhere. A lot of people dream of being rock stars when they’re kids, and then grow out of it. You seem to have grown into it. At what point did you realise that this was what you were going to do with your life? 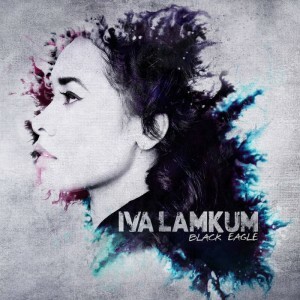 ‘Iva Lamkum: The Eagle Has Landed’ sourced from Rip It Up, No. 348 Aug.-Sept. 2012. Used with permission.